Visit the remote communities of Queen Charlotte Sound aboard a working mail boat. 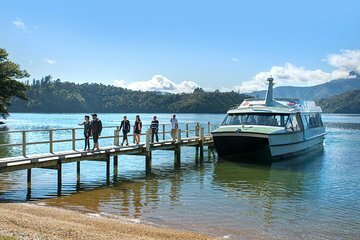 This scenic 4-hour boat cruise departs Picton in the afternoon and makes New Zealand Post rural delivery service along different routes each day of the week. Experience the lifestyle of the Marlborough Sounds firsthand as the boat captain shares regional history and stories of these isolated hamlets. Enjoy complimentary tea and coffee on board and disembark for a 15-minute stop at Ship Cove (1st Oct to 30th April). Returns to original departure point at approximately 5:30pm-6:00pm. Please notify us at the time of booking if you have a connection or are visiting with a cruise ship. View the magnificent scenery of the Marlborough Sounds and get a glimpse of daily life in the remote outposts via New Zealand Post rural delivery service through Queen Charlotte Sound. Meet the mail boat in the afternoon at the Picton waterfront, and relax with complimentary tea and coffee on board. The 4-hour boat tour travels into various bays, coves and inlets detailed by the captain, then wraps up with a stop at Ship Cove (1st Oct to 30th April) where Captain Cook anchored the Endeavor in 1770. You have 15 minutes here to explore the beach and see a memorial to Captain Cook as well as wood-carved Maori statues. Read informative displays about the island and search for birdlife such as oyster catchers, weka and paradise ducks. Mail routes change depending on the day of the week; see the Itinerary for a sample of scheduled delivery. Monday and ThursdayStart by cruising through Queen Charlotte Sound to Kaipapa, a small cove in Kumototo Bay. Continue into Blackwood Bay to drop off mail, then pass a king salmon fish farm en route to Ruakaka Bay where the boat stops at a local residence. Then deliver mail to the Bay of Many Coves Resort and make a few more mail stops at Arapawa Island before pulling into Ship Cove. Tuesday and FridayThe mail boat heads to Curious Cove and then the Tory Channel, traveling along one side past Te Pangu as far as Whekenui, where the Tory Channel enters Cook Strait. Return along the other side of the channel, making a few mail drops along the way, before heading to Ship Cove. Wednesday and Saturday The mail deliveries stop first near the East Bay King Salmon Farm on Arapawa Island. Then sail to the top of East Bay for a couple of mail drops. On Saturdays, the run goes to Cape Jackson, a community that only receives deliveries once per week due to the distance. On your return, stop at Ship Cove. Please note: This is a sample itinerary that can change based on what time of the year you visit. Captain was knowledgeable personable and funny. Fantastic trip ... worth every penny! Would highly recommend this trip! This tour is exactly as described. Really good commentary and it was interesting to see the properties and the lifestyles of the folk at the mail drops. The stop at Ship Cove was great and a chance to stretch your legs. Scenery along the whole sound was very pretty and an opportunity to spot some of the wildlife, especially seals around the fish farm. This was a very relaxing trip. Queen Charlotte sound is beautiful and we were blessed with glorious weather and very calm seas, which all contributed to making this one of our most comfortable and leisurely trips. The postal run itself was fascinating, and it was very interesting in some cases to approach a jetty and collect/deliver post where the property itself couldn't be seen from the boat! It was great to have this very 'local' experience. We thoroughly enjoyed it! Well worth the time. Great experience. Excellent tour. Beautiful scenery, birds, dolphins. Comfortable boat. Good commentary. Easy access from cruise ship.. Interesting tour with beautiful scenery. Great experience! Wonderful scenery and a good insight into living in remote and beautiful area of New Zealand while delivering mail and essential supplies.. Friendly staff and boat operator. Also good to support a local family business. Stop at Ship cove also not to be missed. Great trip. Enjoy the commentary by the skipper, lots of,tales to tell plus local history. Also good stories about th people we dropped off mail and supplies to. The boat was very stable, even in some of the rough stuff close to Cook Straight. Well worth doing.